“The Final Four Tournament” is the product of local difference makers and athletes, including Harlem Globetrotters. Southwark residents say NBA superstar Lionel Simmons used to dribble on the courts of Sacks Playground years ago. Now, several decades later at the 4th and Washington playground, a coalition of local organizations is working toward fostering the next great pro player — or perhaps simply instilling the dream. On July 16, “The Final Four Tournament” youth basketball program, which runs through Aug. 14, kicked off at the Dickinson Narrows public space. 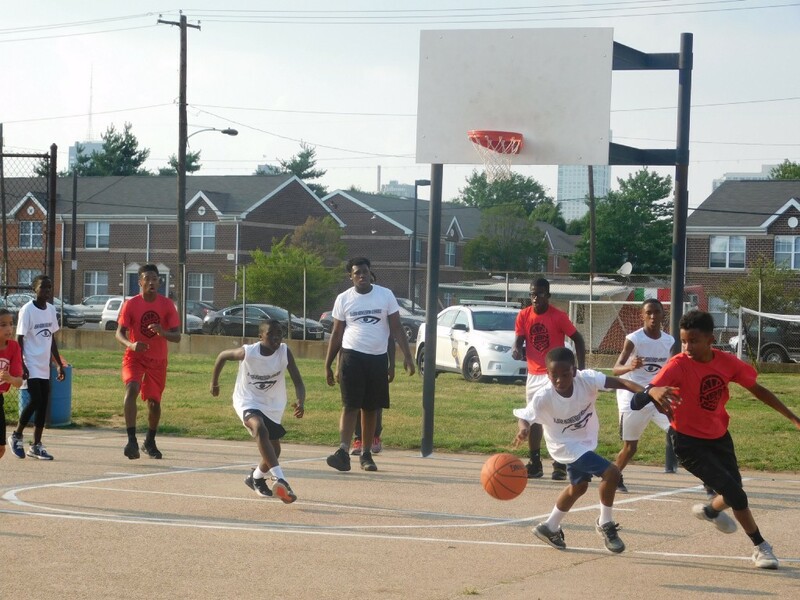 The league, which strives to cultivate not only athleticism but optimism in South Philly children, is the summation of groups from across the tri-state area, including Grind 4 Greatness, I Am Focused Finest, Love Kingdom Fellowship Church, John’s Water Ice and Optimum Health Group in Delaware. Sponsored by the Community to Rebuild Sacks Playground, or CRSP, the program is being funded by Councilman Mark Squilla. But the camp was the idea of college student Jalil Myers, who remembers, in an attempt to ease his mind, coming by Sacks courts late at night to shoot some hoops. Myers, who after engaging in an intense basketball program at a local charter school, is now working toward his bachelor’s and master’s degrees in business from Rosemont College, coined the phrase “Grind 4 Greatness” a few years back. While the saying initially sparked a series of hashtags and T-shirts, the concept eventually morphed into not only a local brand but mentality for local youth. Running a series of fundraisers and events this year, “Grind 4 Greatness” or G4G, has donated hundreds of schools bags to children, as well as hosting art programs to showcase local talent. But its latest endeavour — the tournament — tackles a subject Myers knows well. With assistance from CRSP, Myers connected with brothers and coaches Mike and Joe Richmond — two regional juggernauts in youth basketball, as collectively the men have worked as coaches and ambassadors with the Harlem Globetrotters, 76ers and Delaware Blue Coats. The brothers have a longstanding history with Sacks Playground, as their family grew up not far from the park in South Philly. In 1992, Joe, now based in Delaware, founded Basketball Incorporated, which later morphed into the “I Am Focused Finest” AAU Basketball Program — an organization for young male and female athletes to experience competitive basketball through skills, drills, training, tournaments and league play, according to its website. Joe Richmond, who says he’s been to more than 35 countries and every U.S. state twice, has coached basketball all over the world. Yet, he could not miss the opportunity to mentor at Sacks — his home. A major life skill Joe Richmond hopes the children take away from the camp is the fostering of new friendships, as half of the tournament features young players from Delaware leagues. “We live in different communities but we all wanna do the same thing — play sports and have fun and grow and build relationships. … Everybody that comes on the court doesn’t look like you, not built like you, not from your family, may not go to your school, but you all have the same goal,” Joe Richmond said. Though mid-August, games are held every Monday and Wednesday at 5 p.m. and welcome all community members to Sacks Playground. Residents can enjoy a free basketball game, books, music, water ice and more.